Just two short years had passed since KISS last played in Australia however for the vast KISS army, the legions of fans endeared to the juggernaut of a band since the early ‘70s, two years couldn’t come around soon enough. This tour had the band loading up the stage with a monstrosity, the aptly titled, “spider stage”. The incredible production is moved by 38 computer controlled winches and features 220 automated lights, 900 pieces of pyrotechnics and is powered by 400,000 watts of sound. KISS have always had the biggest and the best when it comes to stage show and theatre to match their explosive hard rock, but this was something else. Setting the scene for the night were a band that originated in Australia with the once, Jon Stevens led, The Dead Daisies. With former Mötley Crüe vocalist, John Corabi now fronting the band, Dave Leslie from our own Baby Animals filling in for an injured Richard Fortus on guitar duties, Damon Johnson also on guitar, Marco Mendoza on bass, Guns ‘N Roses’ Dizzy Reed on keyboard and Brian Tichy killing it on the drums, the band already has that big stage presence and the music fittingly matched. With second album, Revolución garnering some lavish praise as one of the best hard rock albums of the last twelve months, the band could not have done any more to impress as support for KISS. Even Gene Simmons himself would have to reconsider his much publicised comments last year as rock is not dead my friend, after hearing these guys live. Ripping into tracks from both albums, the singles, ‘Lock ‘N Load’ and ‘Mexico’ in particular, which had the crowd lapping up the delightful hooks with Corabi’s stage presence and vocal performance, far superior to that of Vince Neil on Crüe’s recent trip down under, not that we should compare. Whilst the Dizzy Reed keyboard solo (Editor – I mean seriously?) perhaps missed the mark, the finale cover of the Beatles, ‘Helter Skelter’, left no doubt The Dead Daisies are indeed a force to be reckoned with in the world of hard rock. With those fabled words, “All right, Perth! You wanted the best, you got the best…the hottest band in the world, KISS”, bellowing over the Perth Arena speakers, it was time for the main act. The massive KISS curtain fell, lights bedazzled, lasers flashed, fire spat up from every angle, the band cascading down on the platform of the spider stage. 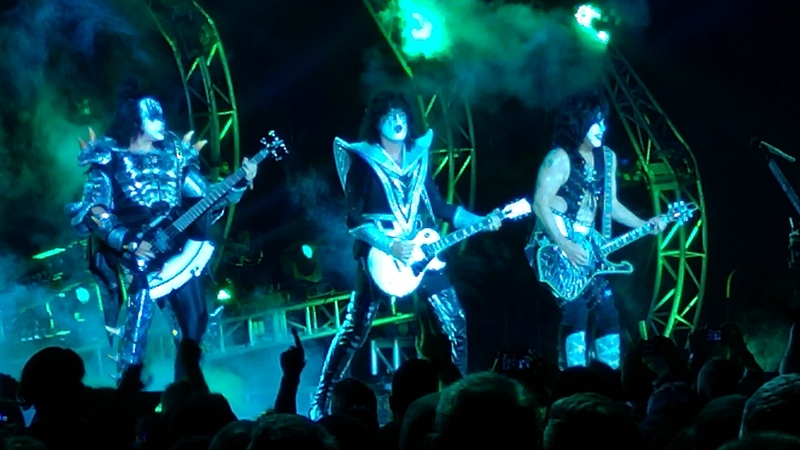 KISS had arrived as they ripped straight into a killer version of ‘Detroit Rock City’. 42 years on, half the original members may have moved on but it mattered very little. With Gene Simmons slaying his axe-like bass, tongue stretched as far it would protrude and Paul Stanley still whipping his hair back like it was 1975, the crowd erupted as one. The set list was nothing short of epic, a greatest hits package spanning the band’s 42 year existence with ‘Deuce’ and ‘Psycho Circus’ quickly following the stunning intro, the band’s incredible light show never letting up across the whole night. Every word was sung in gusto from the audience, a true night to celebrate one of the best in the business. ‘War Machine’ saw a brief interlude with Gene Simmons spitting fire into the air, before more riffage and more exploding stage props. Paul Stanley greeted Perth with much love calling the City ‘a hidden gem’ before heading into more KISS classics. We had the obligatory guitar and drum solos, ‘Spaceman’ Tommy Thayer firing off a killer solo complete with fireworks from his guitar before the stage lifted ‘The Cat’ Eric Singer to the roof as he highlighted his skills with the sticks. “Lick It Up’ had the crowd in unison once again until Gene Simmons took centre stage once more for his next demonic act, the well-known but always well received bass solo complete with Simmons spitting blood and then taking off to the ceiling of the Arena, still pounding away on his beloved bass. Ahhh….Gene….never change. Paul Stanley led the audience into half of ‘Shandi’, sounding much better than he did back in 2013 when he played the same song. In fact the whole band were better, looking re-energised, everything choreographed without incident. The Perth faithful knew what to expect with a KISS show but they didn’t care either, audience members happily dancing, head banging or raising hands to the sky throughout the night. Renditions of much loved tracks, ‘Cold Gin’, ‘Love Gun’ and ‘Black Diamond’ dragging up memories of epic past shows in the KISS history in Australia. Paul Stanley even flying across the crowd to a stage in the middle of the Arena whilst the rest of the band rocked on from the main stage. Ending in three more classic hits including ‘Rock and Roll All Nite’ to finish of the night for an epic encore, with more fireworks, more flames and with mass confetti falling from the roof. Kiss had delivered more than just the usual rock show, this was rock theatre at its finest. Don’t hesitate, make sure you grab your tickets to the rest of the shows around Australia!